What does that statement mean exactly??? – How do I get the fortune out of the list? – How do I make my list even bigger so I can grow my fortune even larger? – What gives the list the right to keep my fortune!?! As you remember in the Web Traffic 101 post, I talked about how to build a high quality email list for free by measuring your LTV (Customer’s Lifetime Value), and now I would like to take this concept even further. If I came to you and offered an endless supply of fresh leads for the low, low cost of $50 per lead, then how would you react? If your LTV is $75, then is a $50 CPL really out of the question? If you had $50 to invest for each new lead you acquired, then how many new customers could you add to your business right now? The reality is your LTV (Customer’s Lifetime Value) might be a lot less than $50, but it could also be a lot more. You simply won’t know until you figure out the numbers, which we’ll show you how to do below. I used to be involved with a particular CPA network (let’s just say it was not a kid friendly environment) where they would instantly pay you $75 for every free trial you gave away. They were essentially paying you $75 for every new email you added to their list. That particular client knew, down to the exact penny, how much each lead’s lifetime value was worth. They didn’t think twice about paying you such a high fee in advance, because they knew they would return a profit. That experience changed the way I see marketing to this day. What would happen if you could pay your affiliates a flat rate for every email they added to your list on top of a commission for selling your product? Do you think you could ignite some dormant affiliates into finally producing some sales for you? If you take the time to invest into uncovering the LTV (Customer’s Lifetime Value) of your email list, then you will open up new realms of possibility for your business. Before I hand the post over to Marcos D’Urbano (SimpleAnalytics.net), I do want you to realize that measuring the subscriber value of your email list is a dynamic metric and not static. The value per subscriber can fluctuate like the sea’s tide depending on numerous factors. That’s the reason why you need to have a plan in place to track everything possible on your site. Do you know how much value a member of your email list will generate during the weeks/months following his subscription? If not, how can you know how much money and/or effort you should spend to acquire him? The subscriber/customer value is a central metric every business owner should know and understand. Knowing the value of your subscribers is a strong motivation to keep building your list, since you will see firsthand how much revenue it is generating. Unfortunately, this hasn’t been a particularly easy thing to do … until now! Add a custom variable to the visitor cookie that indicates when he signs up to your list – when he lands on your ‘Thank you for signing up’ page. Wait some time (a few weeks, or a few months) AFTER your cohort window. Look at the number of goals and goals value that your subscribers have generated since their sign-up date. Some additional coding will be required, and to make this work your goals and goals value must be set. (Read how-to set up goals in Google Analytics if you haven’t set up your goals yet). 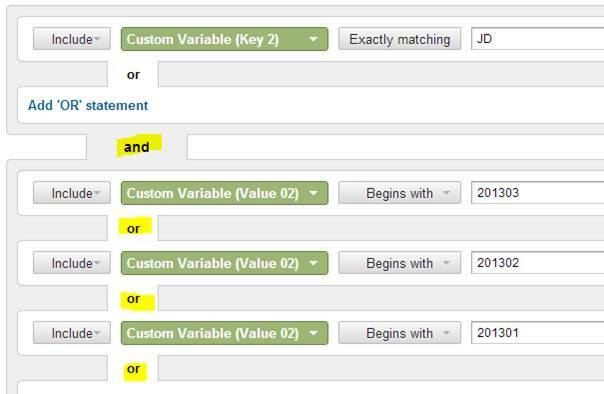 This code will create the custom visitor-level variable JD (Join Date) in the slot #2. (If you already have a custom variable, make sure slot 2 is free). The problem with this code is that it doesn’t work…. If you use this code like this, you will have a custom variable JD created, but the value of this variable will be YYYYMMDD for everybody, instead of 20130315 (March 15th 2013) or the real date we are looking for. To make it work, we need a way to pass the current date to your custom variable. Replace the UA-XXXXXX by your Tracking Code ID. The code in red is the one you need to add to your Google Analytics tracking code. or to track multiple months (Q1 2013 in this case) do the following. Once your advanced segment is created, you can select it and look at your Conversion report to see the value generated by your subscribers cohort. By Looking at the Conversion Report, you will know how much value was generated by your cohort (March 2013 subscribers in this case). You can, of course, track all of your favorite metrics for this cohort exclusively, or compare the behavior of your cohort with another segment. The next time you are hanging at the lobby bar during any Internet Marketing conference, you will be able to tell to your neighbor, “I have a list of X thousand customers, each one generates $X during the 6 weeks following their subscription.” Smile and take another sip of your well-deserved margarita – Frozen por favor. Besides growing to be one of my Google Analytic heroes, Marcos runs SimpleAnalytics.net. Marcos has the ability to turn one of the most confusing and frustrating aspects of marketing (tracking and analytics), into child’s play. To see the full post click here. He’s spent the last 10 years working in data mining and marketing analytics for large Canadian corporations, and I’m so glad he’s a LeadPages customer. Use the information he provided in your email marketing campaigns today! If you have any questions, then leave them in the comments below.